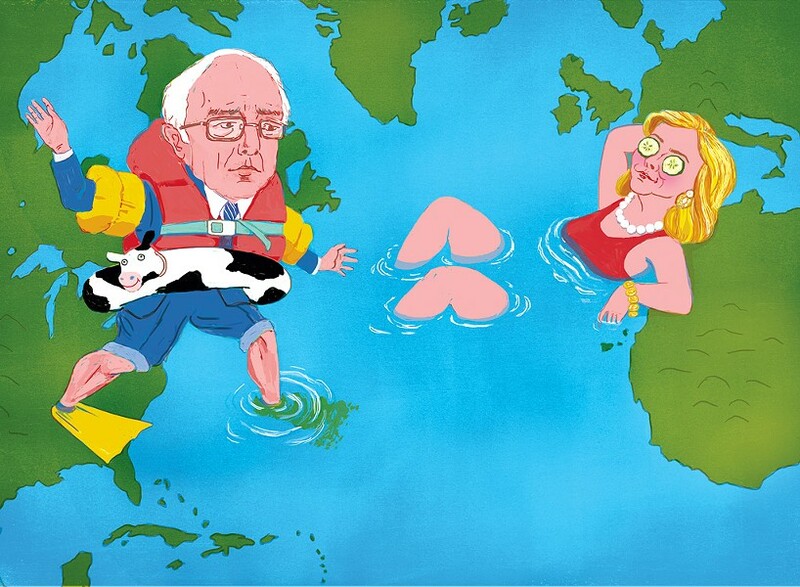 Where Does Sanders Stand on Foreign Policy? It's a truism of presidential politics that foreign policy matters little to U.S. voters as long as the country isn't embroiled in a major war. But independent Vermont Sen. Bernie Sanders could find it to be a major challenge in his bid for the Democratic nomination. In the age of global terrorism, Americans may prefer a candidate who's steeped in the workings of the world, rather than a comparatively parochial figure with little experience beyond U.S. borders. "When he starts debating Hillary Clinton, who has such a deep knowledge of foreign policy, he's going to have serious problems," predicted Robin Lloyd, a longtime Burlington peace activist. Clinton, a former secretary of state and U.S. senator who also spent eight years in the White House, might well turn toward Sanders in the first of those debates — to be held in Nevada on October 13 — and say something like: "Why would the American people entrust the presidency to someone with no experience in foreign affairs?" Sanders does have a record on international issues, starting with his tenure as Burlington's mayor and running through his 25 years in the U.S. House and Senate. He has voted more than once on whether to send U.S. troops to war — and hasn't always chosen diplomacy over violence. Sanders did vote — with the minority — against both Iraq-related wars. In 1991, he cast one of 183 "no" votes in the 435-member House on a resolution authorizing the elder president Bush to use force to end Saddam Hussein's occupation of Kuwait. Eleven years later, Sanders was among 133 House members who voted to prevent the younger president Bush from attacking Iraq. And that stance, on a war that became deeply unpopular, has enabled Sanders to hammer Clinton — who voted to authorize the use of military force in Iraq in 2002 — on a foreign policy issue. But Sanders has in turn been slammed by some progressives for his support of the 1999 U.S.-led bombing campaign against Serbia following its massacre of Muslims in the contested territory of Kosovo. Jeremy Brecher, a former member of Sanders' staff in Washington, D.C., resigned in protest over that vote. Three days after the 2001 terrorist attacks on New York and Washington, Sanders joined 419 House members in authorizing war in Afghanistan. More recently, Sanders backed Israel's attacks on Gaza last summer. Numerous progressives, in Vermont and nationally, have criticized him for that stand. Ben Dangl, editor of the Burlington-based foreign-affairs journal Toward Freedom, called it "inexcusable" and "deplorable." Green Mountain Veterans for Peace spokeswoman Adrienne Knapp said Sanders was "completely wrong" to support an Israeli operation that killed more than 1,400 Palestinian civilians. On the larger issue of Israel's occupation of Palestinian lands, Sanders speaks in platitudes to both sides of conflict. The U.S. must "fight for Israel's security and existence at the same time as we fight for a Palestinian state where the people in that country can enjoy a decent standard of living," the senator recently told Vox. "My long-term hope is that instead of pouring so much military aid into Israel, into Egypt, we can help improve the standard of living of the people in that area," Sanders added. Mousa Ishaq, an activist with Vermonters for a Just Peace in Palestine/Israel, regards Sanders as "evasive" on U.S. policy in the Middle East. "I agree with him on almost every issue," Ishaq emphasized. Yet he is troubled that Sanders has been "silent" on Israeli settlements in the West Bank, which are widely considered illegal. "He's gotten away with avoiding these issues," the Palestinian Vermonter said. "That's not OK, because you should speak on foreign policy as a member of the House and Senate and especially as a candidate for president." Joshua Chasan, a progressive rabbi in Burlington, said in response to a question about Sanders' views on the Middle East: "I don't really know where he stands on these issues." Asked twice for comment by Seven Days, Sanders campaign manager Jeff Weaver said he would try to arrange an interview with a foreign policy-focused staffer, but that did not happen. Sanders has also been vague on the vexing question of how best to respond to the brutalities committed by the Islamic State of Iraq and Syria, or ISIS. He has not opposed the Obama administration's bombs-away approach, and he echoes the president in saying the U.S. must not commit ground troops. He's called for greater involvement of Saudi Arabia and other Arab states hostile to ISIS. That's not a responsible proposal in the view of Norman Solomon, a California-based media critic and antiwar activist who is a nationally known progressive. "It doesn't make sense to say the U.S. should somehow align itself even more closely with the Saudi dictatorship," Solomon said. He noted that the Saudis have already become deeply involved, with U.S. approval, in fighting a mutual enemy in Yemen. The results have been disastrous for civilians and ineffective militarily. "What Bernie says on the Middle East is very palatable to corporate America," Solomon suggested. Solomon has an even bigger beef with his fellow progressive. "Bernie has chosen to say very little about the warfare state and has concentrated his fire on the corporate state," Solomon said. "I'm personally very supportive of him. But foreign policy is secondary for Bernie, always has been. He's better than Hillary Clinton on foreign policy, but that's a very low bar." U.S. Army veteran Knapp, a Randolph resident, said it's a "contradiction" for Sanders to orate thunderously on economic inequality but to speak in a whisper regarding the $600 billion Pentagon budget. Many progressives view that sum, which represents more than half of all federal discretionary spending, as a potential source of funding for social programs. Lloyd finds it "dismaying" that the leading progressive in the presidential race does not address concerns about military spending. "How are we supposed to pay for all the social-justice and economic initiatives Bernie talks about if we don't cut the Pentagon budget?" Lloyd wondered. Why would a politician who's comparatively radical on many issues take the cautious route of suggesting only that Pentagon cost overruns must be reined in? It's a question that mystifies and frustrates many Sanders supporters. "My hunch," Solomon said, "is that Bernie feels you can't fight every battle." Sanders may be calculating that his relentless attacks on oligarchy constitute enough of a challenge to the U.S. status quo for voters to digest. Taking on the military, too, might risk "splitting his base," Solomon suggested. White working-class voters enticed by Sanders' economic message could, in other words, be turned off if he were to start denouncing U.S. "militarism." But it may also be that the left-winger calling for a "political revolution" doesn't see much to dislike about U.S. military spending. Most Vermonters know, for example, that Sanders has no apparent problem with development of the F-35 stealth bomber, which the U.S. Government Accountability Office estimates will cost $1 trillion. The socialist senator has supported basing a fleet of F-35s at the Burlington International Airport. "That's good for the Vermont Air [National] Guard," Knapp said, "but bad for the country and the world. It's an attack plane, not a defensive weapon." Sanders' stance on the F-35 does not mark the first time he has clashed with the Vermont antiwar left on a local matter. In the mid-1980s, Lloyd recalled, then-mayor Sanders opposed peace activists' demand that the local General Electric plant be shut down and converted to civilian production. The factory was making guns that were shipped to Central America for use against leftist forces, including those then holding power in Nicaragua. Sanders was an outspoken supporter of that regime, traveling to Nicaragua to express solidarity with its Sandinista government. But he opposed the campaign to close the GE plant because of the impact it would have on workers and their families. Does Sanders fear that cutting the Pentagon budget would kill jobs in the United States? He doesn't say, but such a view would not be out of keeping with his record. Sanders' foreign-policy record also included consistent calls for a peaceful resolution to the long-standing U.S. face-off with the former Soviet Union. He and his second wife, Jane O'Meara Sanders, honeymooned in the USSR in the late '80s partly as a conciliatory gesture. In his interview last month with Vox, Sanders spoke eloquently on the imperative of preserving peace. "I'm not a pacifist," Sanders said, "and I understand that sometimes you do have to go to war. I think war is the very, very, very last option. People know that we lost 6,700 brave men and women in Iraq and Afghanistan. They don't know that 500,000 came home with post-traumatic stress disorder and traumatic brain injury, and they don't know what that has done to those individuals and to their families. Before you go to war, you explore every other option." Such comments lead Dangl, the Toward Freedom editor, to suggest that Sanders, "compared to the other candidates, would be less prone to start a new war in the Middle East." Dangl also lauded the senator's rejection of the Trans-Pacific Partnership, a trade agreement pushed by President Obama. Like Sanders, Dangl argued that the proposed deal would harm American workers and, in Dangl's words, "deepen the gap between the wealthy and the poor, globally." On another macro issue — climate change — many internationally minded U.S. progressives view Sanders as by far the best candidate. "I happen to believe that when you talk about foreign policy, at the very top of the list is the need for the United States to lead the world, to work with China, work with Russia, work with India in transforming our energy system away from fossil fuels and into energy efficiency and sustainable energy," Sanders told Vox. "This is not just an environmental issue; this is also a global national security issue as well." Presidential elections don't lend themselves to wonky disquisitions on climate change or Asian trade. Voter perceptions are more likely to turn on how a candidate responds to a debate moderator's "gotcha" question — such as, "Who's the president of South Africa?" Sanders has 10 weeks to do his homework. Clinton has already handed hers in.